The AAU competitive gymnastics program at Oklahoma Gold Gymnastics is a natural progression from our recreational program into competition. 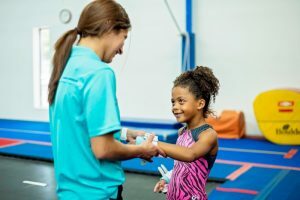 Gymnasts may be invited from Gold Nuggets to try out for the AAU competition team where they will begin to compete in gymnastics competitions around the state. Gymnasts will start in Level 3 and may progress in levels as they accomplish more advanced skills and routines. AAU competitive gymnastics is different from USAG competition because time commitment for parents and gymnasts is cut in half, the financial commitment is less and there is more emphasis placed on individual performance and effort, and less on winning. If your child has aspirations to compete one day, our AAU program would be a great place to start. A large majority of Oklahoma Clubs are offering AAU competitive programs because the participation costs are relatively inexpensive and the practice required is considerably less compared to the USAG Junior Olympic Age Group program. AAU is a good way to ease your child into competition from a recreational program. My daughter is currently a Gold Nugget, where does she go from here? The progression upward is the AAU Competitive Team Program. Does the AAU Competitive Team do more advanced skills? It depends on what level the child is in. The AAU Competitive Team is designed to prepare athletes for competition. This means putting routines together, memorizing them and getting ready to perform them in a competitive environment. They will still do the basic skills required in gymnastics but will add difficulty to those skills as they progress. Will the AAU Competitive Team Coaches let us know when our daughter is ready for competition? Describe the competitive meets they participate in? AAU meets will be held at gymnastics clubs around the state. Membership in AAU is required to participate. The meet schedule will consist of approximately 4-5 meets during the season (December-April). The entry fee is usually between $35-$45 per meet. The level of intensity is still novice in nature, and this is a good entry level competitive program for most gymnasts.